Karla Black prioritises material experience over language as a way to learn about and understand the world. Her sculptures are rooted in Kleinian psychoanalysis, and in formlessness as it has been understood at specific moments in art history. Inherent in the work is also a lively interest in recent scientific theories about the behaviour of the material world – in particular developments in physics that show how, at quantum level, a particle can be in two places at once. Only when the particle is observed does it settle for a single position. Karla Black is captivated by the idea of the quantum world as a world of possibilities where nothing has yet decided what it is or what it will do.? 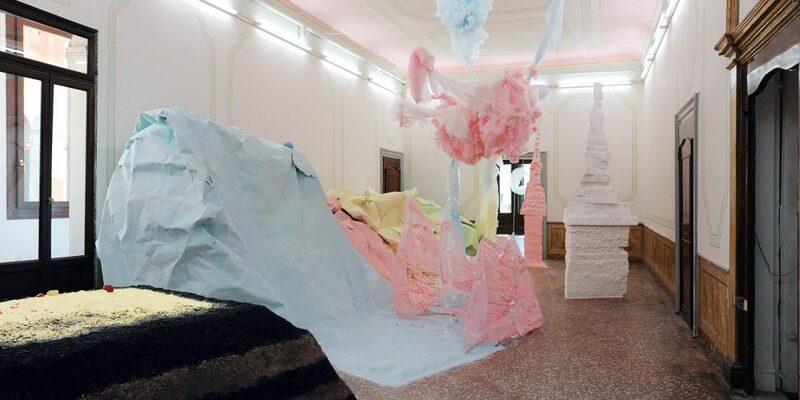 In this major solo exhibition, commissioned by Scotland + Venice and curated by The Fruitmarket Gallery, forms and compositions in Vaseline and marble dust, sugar paper and eye-shadow, soil, powder paint and plaster, polythene, cellophane and soap, in crumbling, peeling washes or dustings of high key mid-colours like peach, baby blue and pastel pink, provoke at least an impetus towards physical response. These sculptures are caught between thoughtless gestures and seriously obsessive attempts at beauty.? ?